Eight F/A-18A/B classic Hornets from the RAAF’s 75SQN have deployed to Cold Lake AFB in Alberta, Canada to participate in Exercise Maple Flag. The exercise, from June 11 to 22 is a complex international training event which this year will involve the air forces of Canada, Belgium, Brazil, France, Norway, Qatar, Saudi Arabia, the US, and Australia. “Exercise Maple Flag offers our people realistic training within a complex operating environment that is both challenging and constantly evolving,” detachment commander and commanding officer 75SQN, WGCDR Michael Grant said in a statement. Training scenarios at Maple Flag include command and control, air-to-air and air-to-surface combat, air-to-air refuelling, intelligence, surveillance and reconnaissance, tactical airlift, tactical aviation, and close air support. 75SQN will continue to operate its classic Hornets until 2022 when it will be the last 81WG squadron to transition to the F-35A Lightning II. 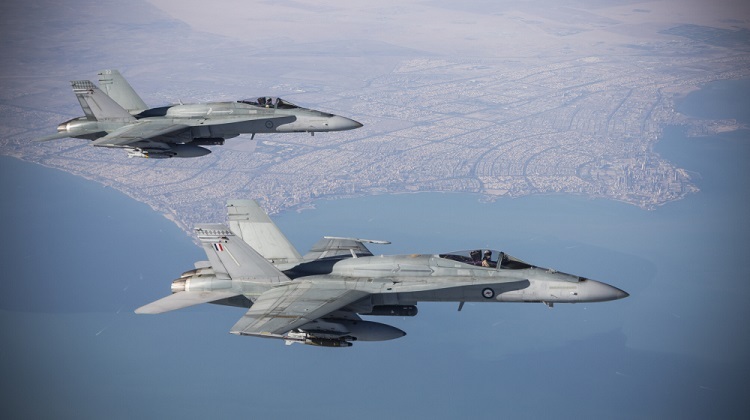 “Exercise Maple Flag offers our people realistic training within a complex operating environment that is both challenging and constantly evolving,” … not to mention an opportunity to showcase to the Canadians how good our second-hand F/A-18s would be for them to buy from us! I wonder when the RAAF will start paying off the Hornet. I don’t imagine 3 squadron will be flying them for much longer. 3 SQN have already given their aircraft back to 81WG (I think 77 SQN got most of them). They’re over in the USA ramping up the F-35s. The RAAF still has to convert them to LHD before the RCAF will take possession.